The head of Saturn's huge northern storm is well established in this view captured early in the storm's development by NASA's Cassini spacecraft in late 2010. Like a monstrous snake biting its own tail, a giant storm on Saturn raged until it wrapped completely around the ringed planet and ran into its own wake, causing it to fizzle out, scientists say. The monster Saturn storm is the first mega-storm in the solar system that astronomers have ever seen die by consuming itself. Scientists are still perplexed over exactly how the process worked. This set of images from NASA's Cassini mission shows the evolution of a massive thunder-and-lightning storm that circled all the way around Saturn and fizzled when it ran into its own tail. The storm was first detected on Dec. 5, 2010. Image released Jan. 31, 2013. "This Saturn storm behaved like a terrestrial hurricane — but with a twist unique to Saturn," said researcher Andrew Ingersoll, a member of the Cassini imaging team at the California Institute of Technology in Pasadena. "Even the giant storms at Jupiter don't consume themselves like this, which goes to show that nature can play many awe-inspiring variations on a theme and surprise us again and again." The storm also spawned a clockwise-spinning vortex early on, which drifted more slowly than the storm's head and grew to be as big as 7,500 miles (12,000 kilometers) across. It is similar in size to a massive storm on Jupiter known as Oval BA. While Earth has mountains, coastlines and other topographic features that help break up hurricanes and other storms, Saturn is a gas giant planet, devoid of such a storm-stopping landscape. The giant tempest only started fading away when its head rammed into the vortex in June 2011 and stopped for good by Aug. 28, after 267 days in action. 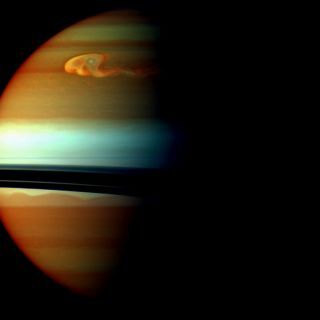 Though it was the longest-running tempest observed on Saturn's northern hemisphere, a storm 100 times smaller formed in a region dubbed "Storm Alley" in the planet's southern hemisphere in 2009, and lasted for 334 days, Cassini researchers said. "This thunder-and-lightning storm on Saturn was a beast," Kunio Sayanagi, a Cassini imaging team associate at Hampton University in Virginia, said in a statement. "The storm maintained its intensity for an unusually long time. The storm head itself thrashed for 201 days, and its updraft erupted with an intensity that would have sucked out the entire volume of Earth's atmosphere in 150 days." The research is detailed in a research edition of the science journal Icarus. Follow SPACE.com on Twitter @Spacedotcom. We're also on Facebook and Google+.